Originally published in 1967 The revolutionary thinker, Guy Debord was the leading figure of the French intellectual group who called themselves The Situationist International. His text, The Society of the Spectacle written in 1967 is one of the greatest theoretical examinations of our socio-cultural condition, describing in pinpoint accuracy, the dreadful corporate globalization craze currently sweeping the planet. His work was instrumental in sparking the student uprisings in Europe in the late sixties. In 1989 he published his "Commentaries on the Society of the Spectacle" Both texts are chillingly accurate descriptions of the world of simulation and lies that mankind has transformed his life into. 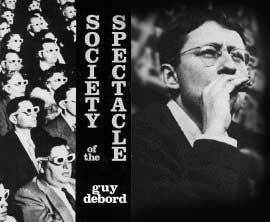 In December of 1994, at the age of 62, Debord killed himself.